Archive from category "CHAIRS FOR SPORTS HALLS"
centers. In the sports halls there are various sports activities. The seating solutions in the sports halls also enables to hold various of events not only connected with sport, as is often done in schools. Many seating solutions of the sports halls build for a large crowd to fit in a terraced seating structure. Of course, there is a need for chairs for sports halls that are suitable for the nature of the events being held and the audience arriving. Anti Vandalism – Chairs for sports halls must be strong and have anti-vandalism properties. Maybe it’s a bit more expensive but it definitely pays off in the long run. Compliance with standards according to the law – Ensure that the chairs meet the standard required by law. with alternative chairs if necessary. 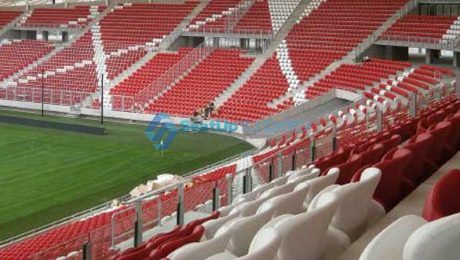 You do not want your sports hall to contain chairs of different types and colors.